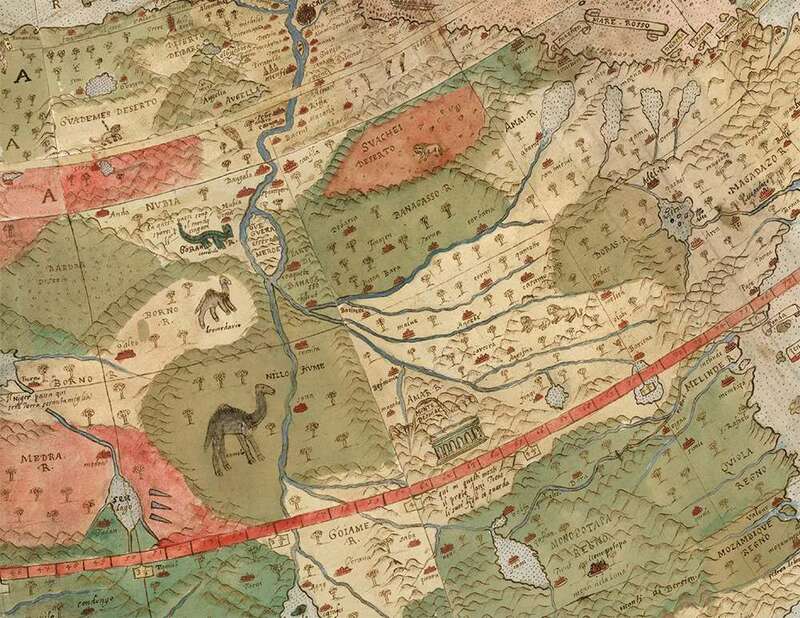 Experts have restored one of the largest known early maps of the world, and it's glorious, mythical creatures and all. The hand-drawn map was created 430 years ago by Urbano Monte. Centuries later, collector David Rumsey and his nephew have painstakingly scanned and digitally stitched together all 60 pages previously bound in an atlas, completing the map for the first time as it was originally intended. While little is known about the 16th-century cartographer who made it, the newly restored map gives insight into how people at the time understood the world. Created in 1587 in Milan, Italy, it shows the world in great detail, and was quite advanced for its day. The world as seen from above, looking down on the North Pole, was a perspective not commonly used by mapmakers at the time. 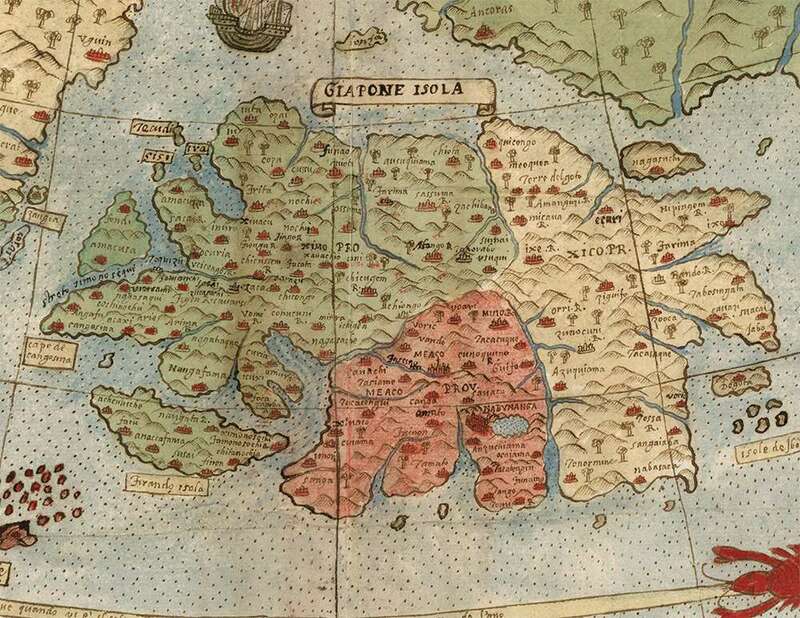 Monte's depiction of Japan also shows a lot more place names than maps made by his contemporaries, likely because Monte met with Japanese delegations when they visited Milan in 1585, David Rumsey writes on his website. However, the map also shows some of the misconceptions illustrative of the time, from unicorns to ships being attacked by mermen. 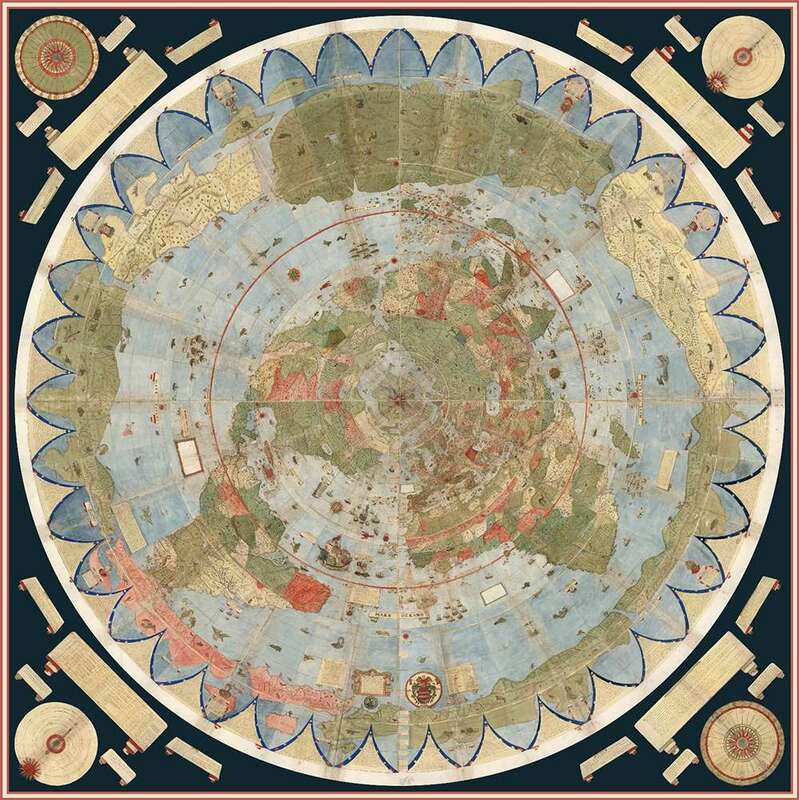 Google Maps this isn't, but it is a fascinating look at how cartographers saw the globe at the time. The map assembled to how it was intended. Monte left instructions for the map to be attached to boards, to create a 10 foot by 10 foot planisphere. David Rumsey. The unusual shape of the map, a circle from above, was because the map-maker wanted to give an indication of the shape of the Earth. "Monte wanted to show the entire earth as close as possible to a three-dimensional sphere using a two-dimensional surface," Rumsey explained. "His projection does just that, notwithstanding the distortions around the south pole." 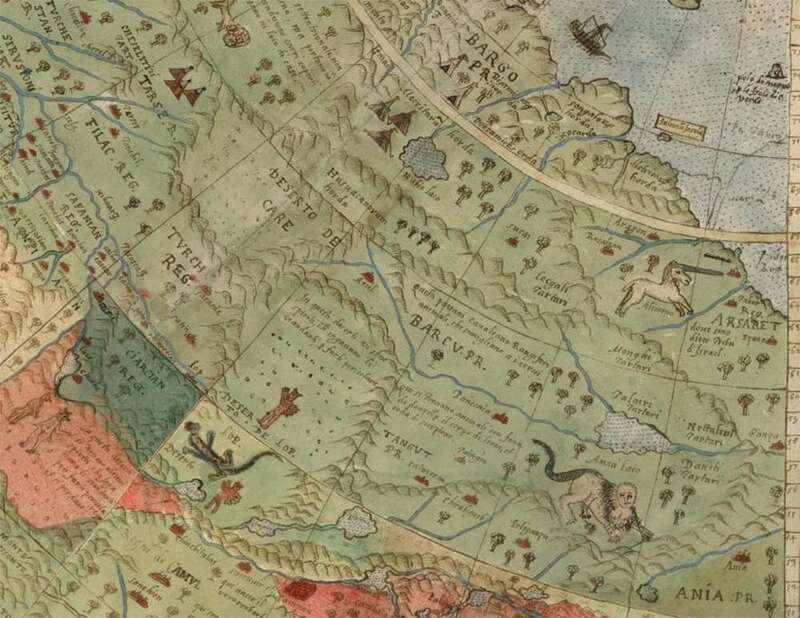 As well as fantastical creatures, the map depicts camels and lions in Central Africa. David Rumsey. 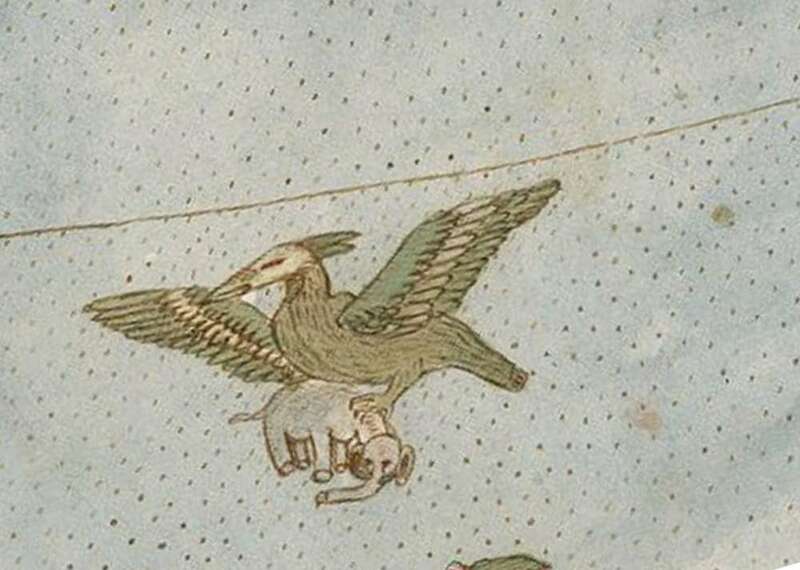 A giant bird carries away an elephant in one portion of the map. Although as the scale of the illustrations are not consistent, it could be a normal-sized bird carrying away a tiny elephant. David Rumsey. 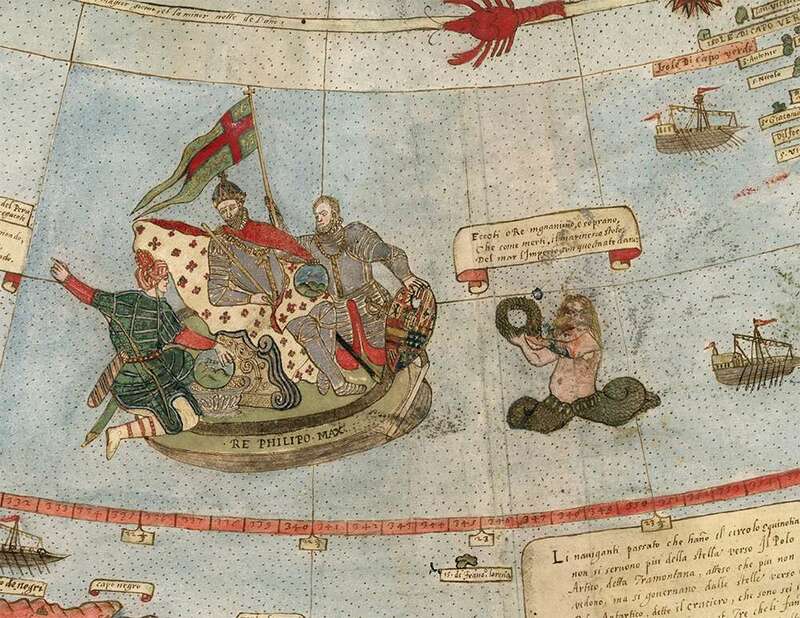 The King of Spain is depicted in one portion of the map, just off the coast of Brazil. His crew appears not to have noticed the merman they are on a collision course with. David Rumsey. Japan includes place names that weren't included in most other European maps at the time. David Rumsey. A unicorn, several devils, and a lizard man roam across the land in this colorful depiction of Siberia. David Rumsey. When georeferenced and then laid out in a more familiar map shape, various distortions of the world can be seen, as well as some familiar and fairly accurate shapes. Antarctica is extremely prominent on Monte's map, which "gave him a vast area to indulge in all the speculations about Antarctica that proliferated in geographical descriptions in the 16th century", according to David Rumsey Cartography associates. Africa looks stretched in this view, as well as North America. 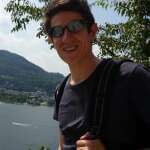 David Rumsey. The whole of the map can be viewed on David Rumsey's blog, as well as a video of the map projected onto a globe using Google Earth.